We sat the corner of the bar as little white puffs of snow floated down from the night sky. Groups of people came and left, leaning over us occasionally to place orders. We were in our own little world, sampling bourbon and tequila barrel stouts and giggling at the odd bits of overheard conversation - "You should totally have a wedding on ice, ride in on a zamboni!" - letting them spark our own. "Could you imagine that with our friends?" I pictured a sloppy arrangement of the old hockey boys struggling to keep it together at such an event. They know how to skate just fine, but it would certainly be a show. I hadn't realized how full the room had gotten. I love that feeling, as if you're the only two there, tucked away and happy as a clam at high water. I am a lucky girl. For our date Friday night I kept things simple and comfortable in a romantic embroidered top with an open camel colored cardigan (that JD assured me did not look frumpy), dark wash denim, and the most comfortable suede over the knee boots. As the weather has been challenging (hello blizzard 2015!) we have been experimenting with shooting indoors as of late. It's certainly not the same, but it is warmer. To all of you currently enjoying this blizzard, stay safe and warm! There is that gorgeous shirt I am obsessed with again! Love it! And those boots are gorgeous! WOW! I think I'd live in those! 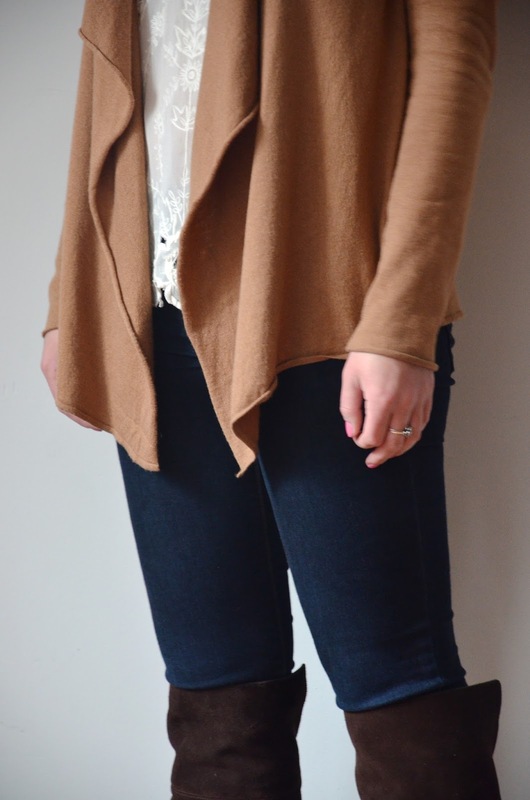 You definitely do NOT look frumpy in that cardigan! It's gorgeous and looks so comfortable! I love how you mentioned a zamboni......all those years of skating growing up! This outfit is totally my uniform when it's cold out! I love the boots!! Good luck with all of the snow! Love this simple color scheme! That top is so pretty! And I'm obsessed with your boots! they're the perfect color! Gorgeous top! Love the lace detail. 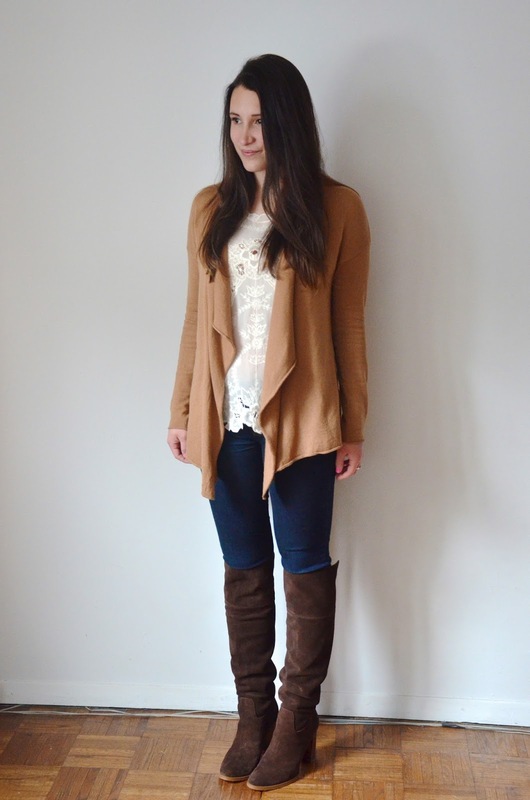 great outfit, and great post! <3 hope the blizzard is treating you well! Those boots are perfect, I love them! This outfit is lovely! Completely stunning. And I second loving that feeling of being the only two who exist in a crowded room!